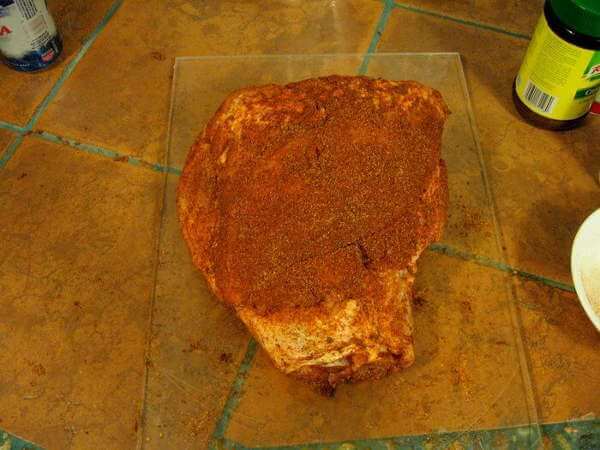 Using quality dry rub recipes can make a huge difference in the quality of your smoked meats. Some dry rub recipes add so much flavor that it's possible you'll find that barbecue sauce just isn't needed. 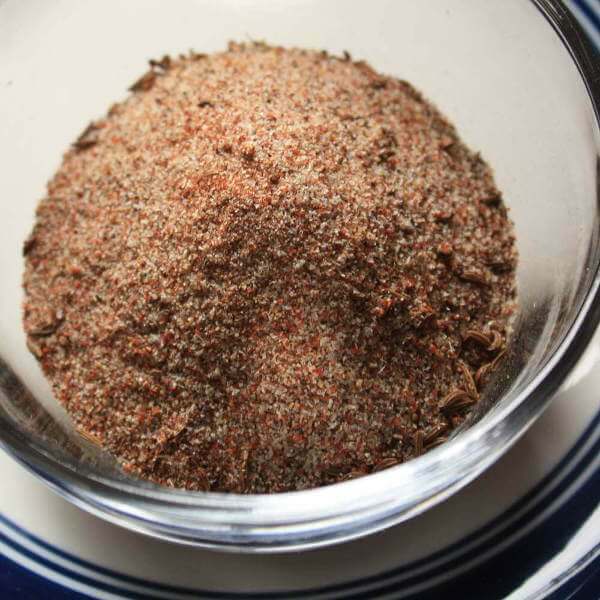 Instead of buying prepared seasoning mixes, making your own rubs for ribs, beef and poultry is the way to go. You'll be able to control the salt content, fine tune the flavor to your personal taste, and maybe even save a few bucks! See The Caraway Seeds In The Beef Dry Rub Ingredients? Create Your Own Dry Rub Recipes! 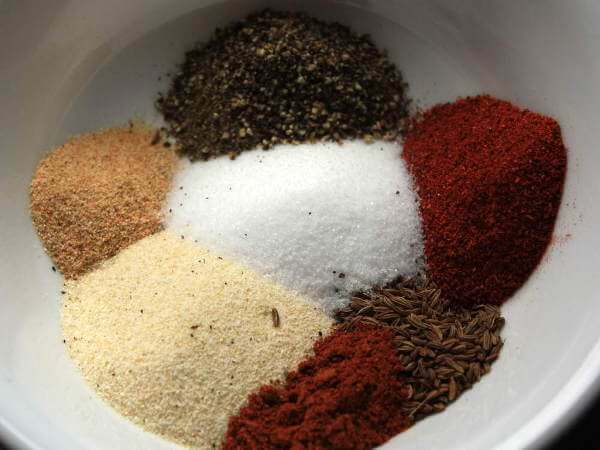 When concocting a dry rub recipe, consider these guidelines when measuring out your ingredients. There are no hard and fast rules to follow - flexibility is what makes experimenting with your rub recipes so much fun! There are four main considerations: the salt/sugar ratio, the amount of heat desired, the type of base flavors wanted, and any special flavors that could be your "secret ingredient". Beef and poultry rubs don't need to have a sweet flavor, so a higher ratio of salt to sugar is best. Pork, on the other hand, goes well with a sweeter flavor, so more sugar than salt is desirable. Most fish calls for a dry rub that's light on the sweetness. An exception is salmon, which can be good either way, salty, or a bit on the sweet side. 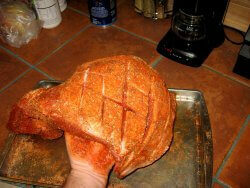 A Pork Dry Rub Recipe, Combined And Ready To Use! Use a salt that is pure, like kosher salt or canning salt. Most table salt has anti-clumping additives that can add off-flavors to foods. Canning salt is much more dense than kosher salt, so it's something that's best measured by weight. There are several types of sea salt that can be used. These might add a subtle additional flavor to a dry rub, but in reality, any flavor that's in a sea salt would probably be overpowered by the other seasonings. 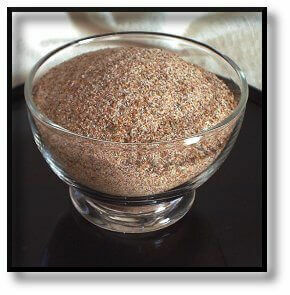 Smoked salt is another rub ingredient option, and would give a boost the the smoke flavor of your meats. There are many sweetening choices. White cane sugar, brown sugar (light or dark), and raw sugar (turbinado) can all be used. White sugar adds only sweetness; brown sugar will give the rub a bit of molasses flavor, which I find is better with pork. Raw sugar has a flavor similar to brown sugar. 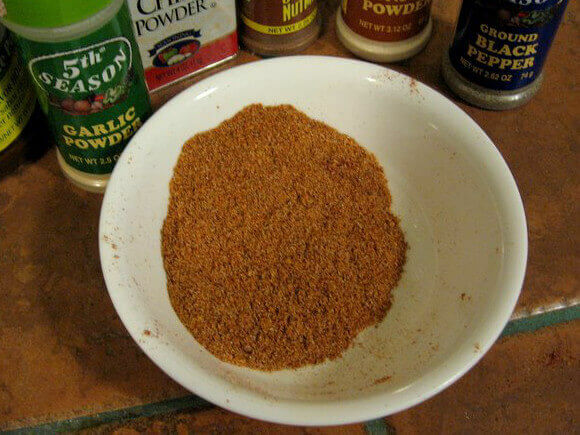 Brown sugar is slightly moist, so it's best to dry it before it's mixed with the other dry rub ingredients. Spread it onto a cookie sheet and allow it to air dry overnight, or place the sheet into a warm oven (200 degrees) for an hour or two. Black pepper, with its pungent taste, is commonly used in rub recipes. Its cousin, white pepper, has a milder flavor and mostly adds only heat. Capsicum peppers that add heat include ground cayenne pepper and ground chili pepper (not to be confused with chili powder, which contains ground chilis and a variety of other seasonings). These seasonings are milder than the others, and used in greater amounts. Included here are things like onion powder, chili powder and paprika. Since these comprise a large amount of the dry rub, it's important to use high quality products. 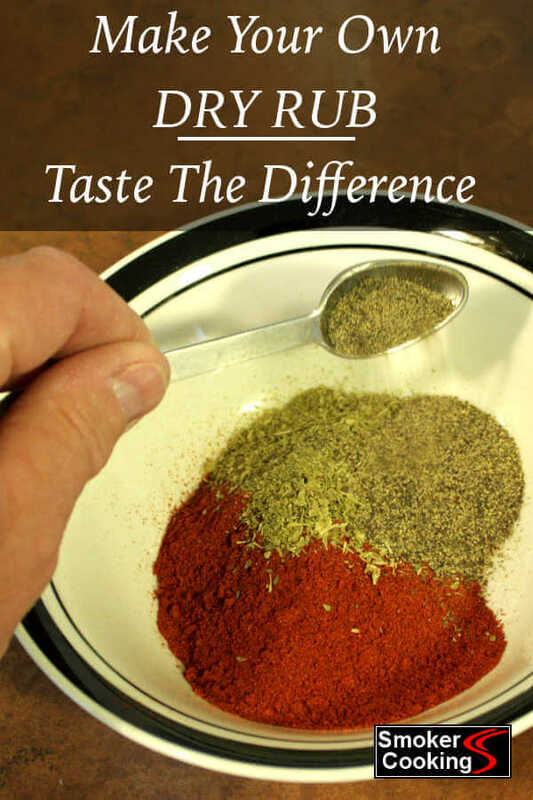 Cheap, low quality seasonings might add undesirable flavors. These are used in smaller amounts, sometimes just enough to give an impression of a flavor. Nutmeg is one like that - just a pinch can be enough to make you wonder "just what is it that I taste there?!" Other flavors in this category include seasonings like garlic powder, thyme, rosemary, fennel, caraway seeds, oregano and mustard powder. Score the fat into a cross hatch pattern after trimming the brisket. This allows the dry rub flavors to reach the meat that lies underneath the fat. 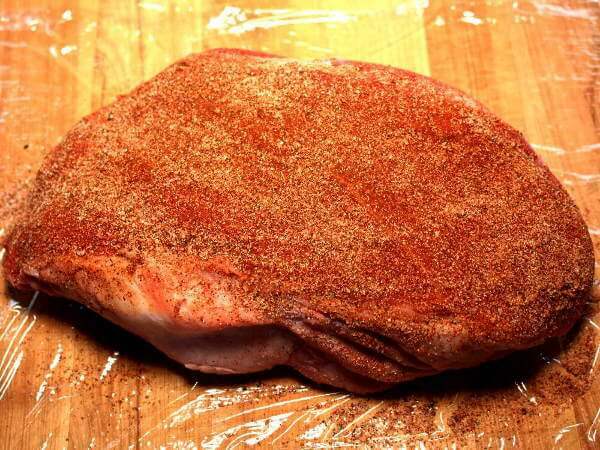 Season the brisket on all sides with a liberal amount of your favorite dry rub recipe. 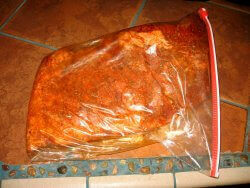 After applying the rub, either wrap the brisket in plastic wrap or put it into a large food storage bag. Keep this in the refrigerator for at least one day, or two days if a deeper flavor is desired. 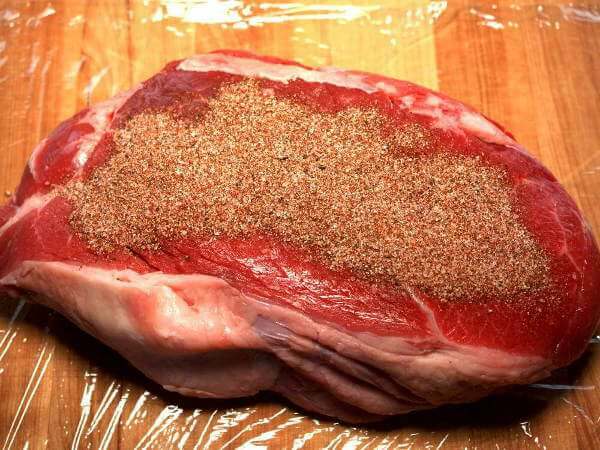 A portion of the rub has been poured onto one side of the beef cross rib roast. 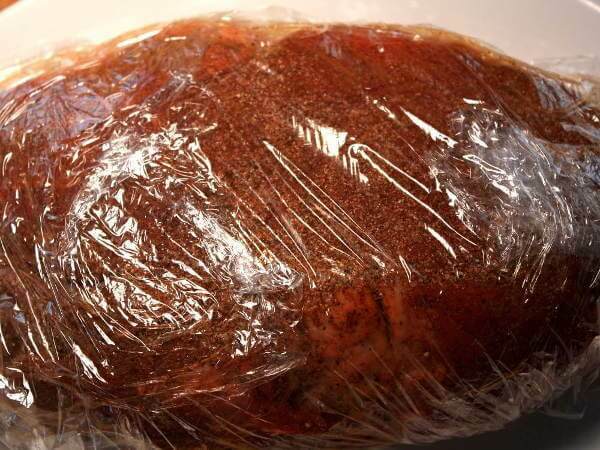 Note that the roast is resting on a section of plastic wrap as it's being seasoned, which helps keep the work surface clean. Press the seasoning evenly onto all sides of the roast. The plastic catches any of the rub that falls off, minimizing waste. 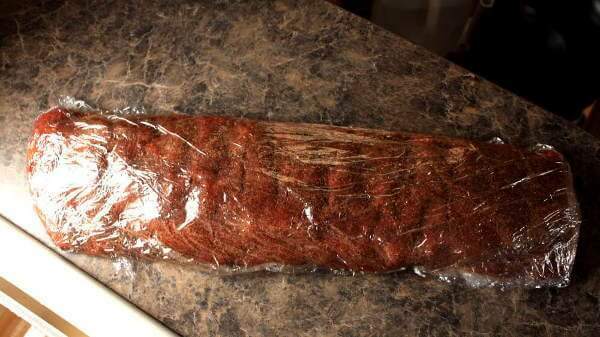 Wrap the now-rubbed cross rib roast tightly with the plastic. 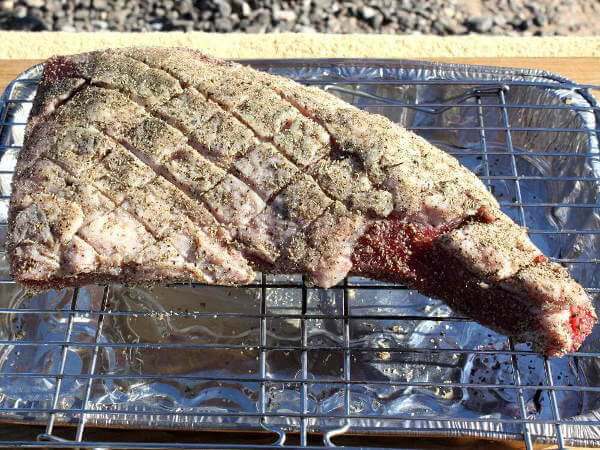 Like the brisket, the longer the meat rests in the seasoning before smoking, the more intense the flavor will be. With this smaller cut of beef, six hours to one day in the refrigerator before smoking would be perfect. Smaller size cuts of meat and poultry can be placed in the smoker immediately after seasoning. Here are a few of my favorite dry rub recipes for ribs, chicken, turkey, brisket and pork. Try one of the recipes on this page, or start from scratch and create your own rub recipe. If your recipes turns out really good, you can send it to me by way of the Contact page if you like, and I'll post it here (credited to you) at Smoker-Cooking.com.